The Rancher 20" chain saw features easy to use operator controls such as a combined choke/stop control, smart start, and an air purge priming ball. The side mounted chain tensioner allows easier access to the chain tensioning device, and the 7" offset handle grip helps reduce fatigue. 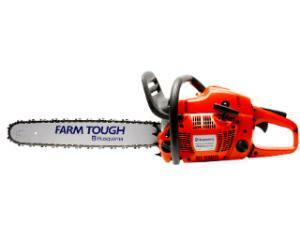 Contact with roots and dirt will immediately dull chain saw teeth. ONLY USED FUEL PROVIDED WITH SAW!! * Please call us for any questions on our chain saw gas 20 inch rentals in Hillsdale and Ridgewood NJ.